– Picking up marbles from bowls of soapy water with chopsticks is not as universal a party game as I thought it was when I was 8 (we lived in Hong Kong, you start with m&ms and work your way up to marbles). – Europe is awesome, not the least of which because if you drive about 4 hours in any direction you’re going to be in another country with an entirely different language, currency, and food (yes, I’m still bitter about the Euro). Also, it gives you a totally unfair advantage when memorizing slides of medieval buildings for an art history class. – Don’t leave home without your passport (this mostly applies to living in Geneva where you can more or less accidentally cross the border and then find yourself stuck). – The US has the best libraries – this is not inconsequential when you grow up with a children’s librarian and are the kind of child that has to be told to go outside and play and not sit around reading all day. The local English language library was one of the first places we would find whenever we moved. – England has the best candy selection (although we used to smuggle Peppermint Patties home in our luggage and freeze them for special treats). – If you’re trying to drive from Paris to Geneva during a major trucker’s strike, don’t turn left when you leave Paris because you’ll be on the wrong side of every river in France. – Hangers, left alone in a closet, will breed. – Every time we moved we’d take about three car loads to the dump before we left and more would get thrown out when we unpacked. It’s astonishing how much stuff you can accumulate in just 2 years. I have never been so grateful to be living on another continent as I was when my parents retired and moved out of the house they’d been living in for (gasp!) 10 years. – If you haven’t used it since the last time you moved then you should throw it away – substitute ‘in 2 years’ for ‘since the last time you moved’ for normal people. – If you can’t think of when you’ll ever use it, or where you’d put it, don’t buy it. It’s not by chance that the last three are all about not accumulating stuff. Don’t get me wrong, I’m the product of a materialistic culture. I own more clothes and shoes and books and blankets and knick-knacks than I need, or have the time or inclination to dust regularly. However, I own less than I might because everything I think about buying gets passed through an internal censor of ‘what will I do with this’ and ‘in two years will I still want to own this’. Hence, I have a steam-punk clock on my hall table, but I don’t have any number of candlesticks that I’ve seen, admired and contemplated buying. Since I no longer can rely on the process of moving every two years to purge my stuff I find that I now occasionally get restless and do it randomly. Two weekends ago I weeded our collection of table clothes and winnowed it down to the ones that actually fit our table. Last weekend I weeded my cookbook collection and eliminated all the ones I don’t actually use – so that I can actually shelve all the ones I do use, plus the ones I keep for nostalgic purposes (like my grandmother’s cookbooks) and the ones I keep for the purposes of entertainment (all the terrifying ones written in the ‘60s and ‘70s that explain why everyone drinks so much in Mad Men). And, since I was over in that section of the bookshelves I also set about purging and reorganizing my loose leaf recipe files which had gotten a tad out of hand. I threw away a couple of inches worth of recipes I had culled from various places and never made – I firmly did not allow myself to keep them on the off chance that I might make them now despite the fact that I haven’t in the past five years even if they still sound really tasty (peanut crusted fish fillets with fried plantains). And then, because it was a rainy Sunday and I’d already been to the grocery store I started reorganizing them with a vague hope that if I did I wouldn’t have to paw through a huge stack of recipes every time I wanted to find something, or try and figure out what logic I was using when I filed Baked Beans under Main Dish – Beans, but Spicy Black Beans with Bell Peppers and Rice under Main Dish – Vegetarian – Beans. I’m not saying that my new system – broken down by meal, main ingredient, and then alphabetized by main sub-ingredient (for example Grilled Chicken with Pumpkin Mole is filed under Main Dish – Chicken, and then alphabetized under P for pumpkin) – will make any more sense to me in a month than my old system did, but it might and right now it makes perfect sense. Preheat oven to 450. 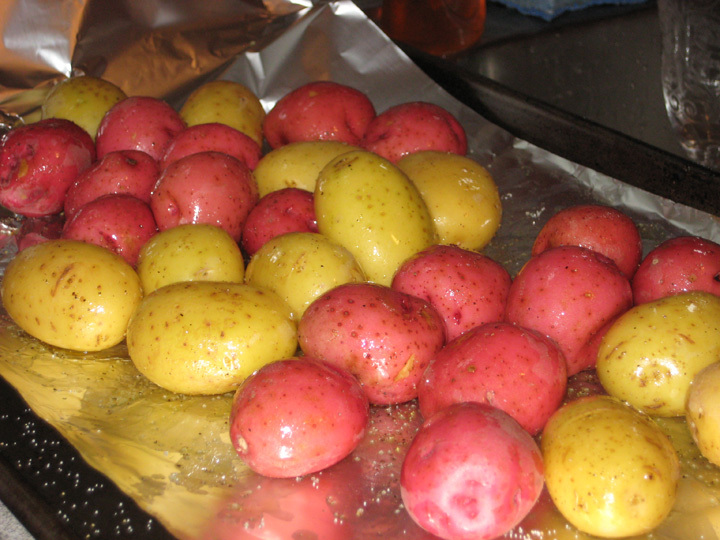 Place the potatoes on a 3 foot long piece of foil and drizzle with olive oil, coarse salt and ground pepper. Bring edges of foil together to make a sealed packet, place on baking pan and bake for 40 minutes. Meanwhile, combine both cheeses, lemon zest and salt to taste. When potatoes are done, cool just until you can handle them, then cut a small X on each one and squeeze open. 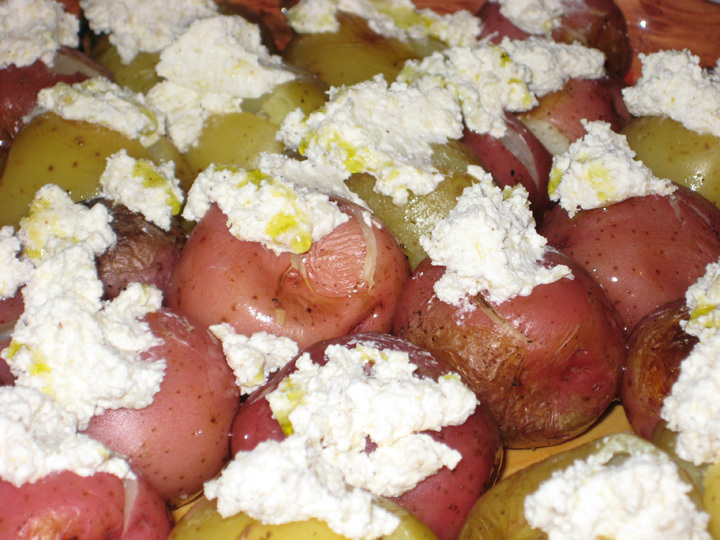 Place a spoonful of the ricotta mixture on each potato, grind some pepper on top and drizzle a little more olive oil on top. Serve immediately. For something that’s this iconic, it’s remarkably easy to make. The only really tedious part is peeling the garlic which I did on Tuesday night while I watched the end of Coraline. Dry the chicken and then salt and pepper generously. 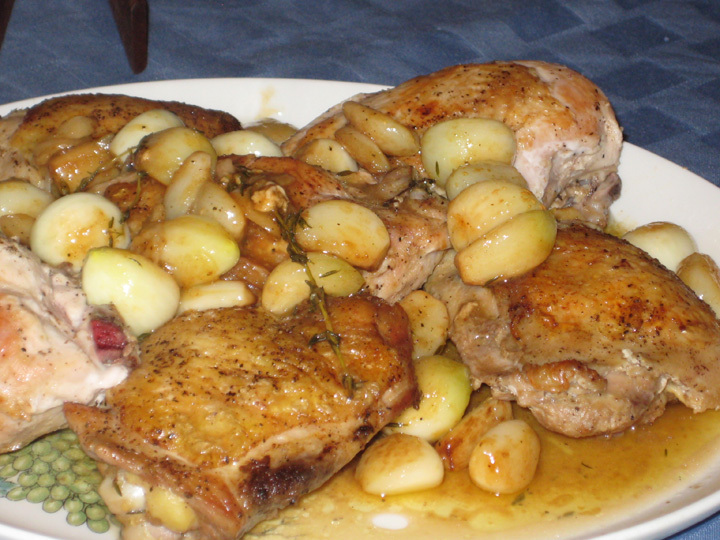 Melt the butter and olive oil in a wide skillet over a high heat and place the chicken in the pan skin side down. Allow to brown for 5-10 minutes, until well browned. Flip over and allow to brown on the other side for another 5 minutes. Remove the chicken from the pan. Add the garlic cloves. Allow to sauté for 5 minutes until the garlic starts to brown slightly. Add the wine and chicken stock and deglaze the pan. Add the thyme and return chicken to pan skin side up. Turn the heat down to medium-low and cook for 15-20 minutes until the chicken is cooked through. Remove the chicken from the pan and allow to rest for 5 minutes. Turn the heat up and bring the sauce to a rapid boil and allow to cook down slightly. Remove the thyme springs. Return the chicken to the pan to coat with sauce, and then serve, pouring reduced sauce and garlic over top. My roommate made brown sugar cupcakes (from, you guessed it, the Martha Stewart cupcake book) for a work party. Unfortunately they burned the first time around (they burned the second time around too, but less egregiously). Since we were left with 18 cupcakes with burnt edges and it seemed a little sacrilegious to throw away something that involved that much butter and sugar and that smelled that good, she cut the burnt edges off and diced them up as a shortcake replacement for strawberry shortcake. 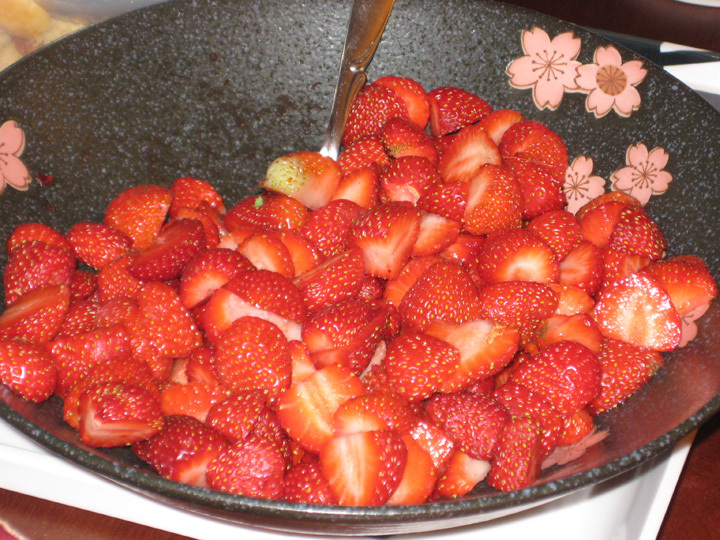 I bought fresh strawberries at the farmer’s market and sliced some of them, mashed some of them with a little sugar and triple sec, whipped some fresh cream, and let people assemble their own strawberry desserts. I would really like to see what a steam-punk clock is. I am still amazed at people who did not/do not know or belong to their local library.